Hope Cottage It is particularly ideal for those travelling to Cornwall via train as Par station is only a very short walk away. The Royal Inn is next door and does good food, whilst there are countless attractions to visit within a short distance of the property. A traditional terraced 2 bedroom cottage with a newly fitted modern kitchen and little walled patio garden to the rear. The property has been widely refurbished by the current Owners and the living space is presented to particularly high standards for a property in this price range. 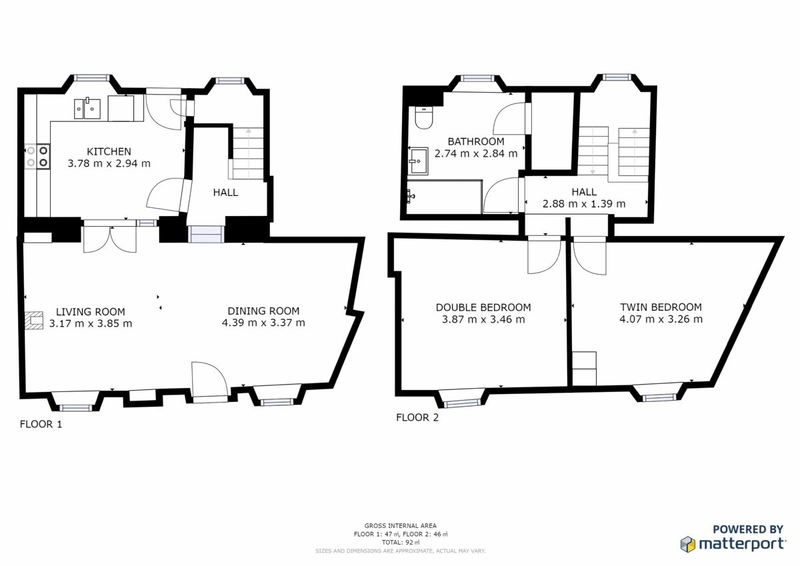 Ground Floor: Large sitting room & dining area and newly fitted kitchen. First floor: Double room with king sized bed, twin room, large bathroom with toilet, sink and large shower. Exterior: Small walled patio garden to the rear. The property is centrally heated and fully double glazed throughout. The kitchen is fully fitted with a range of cupboards, electric oven & hob, fridge with freezer compartment & microwave. There is a washing machine in the out house. There is a flat screen digital TV with a DVD player. There is also a digital radio in the kitchen. An iron and ironing board are provided. WiFi is available at the property. Electricity, heating & bed linen are all included, but you will need to provide your own towels. There is no off road car parking at the property, however there is plenty of on street parking available immediately outside the property. Regrettably, dogs are not permitted at Hope Cottage. We regret no smoking is permitted. A travel cot & highchair are available upon request. Fowey (pronounced Foy) is one of the most iconic places in Cornwall. Set on the steep banks on the Fowey Estuuary, the narrow streets and alleys are just great to explore. Views of the harbour are dramatic just watching the activities in the harbour can keep you occupied for many hours! Life in Fowey revolves around the water. The local fishing fleet land the freshest catches and local specialities include mussels, oysters, clams, crab & lobster. There are some great restaurants and pubs around and nearby. Try one of Sam's restaurants or a little drive inland to the historic Crown Inn at Lanlivery is well worth the effort. Life on the water culminates in the middle of August with the Fowey Regatta Week where yacht racing takes place all week. Watch the historic Famouth Working Boats racing in the close confines of the estuary or enjoy the many festivities around the town. The highlight is without doubt the spectacular display by the Red Arrows who rate Fowey as one of their most dramatic displays because of the steep valley. There are countless attractions near to Fowey including the Eden Project, Lanhydrock House & Gardens and the beautiful Luxulyan Valley. The Eden project is 3 miles Fowey 3 miles. Lost Gardens of Heligan 10 miles. Almost on the doorstep Par duck ponds & woodland walks link to the Clay trails long distance cycle paths. For garden lovers there are many open gardens to explore including Marsh villa Garden just 50yds away! You are in the heart of Du Maurier country with many places to find on the literary trail. Du Maurier Festival in May, Fowey Regatta August. (ask for details). Consult the guide books & folders in the cottage & explore to your hearts content! A pleasure to visit Hope Cottage. Guest from Bromley stayed for 7 nights. I stayed with my wife and two daughters (18 & 11) . We were plesently surprised with the cottage and its decor with a very nice modern large shower,Good location for exploring all of Cornwall, Good local shops within walking distance, Friendly neighbours, lots of local information provided in the cottage for places to eat and visit. I would definitely use Hope Cottage again for a stay in Cornwall ,also we will be recommending Hope Cottage. We had a fabulous week at Hope Cottage. Lovely cottage.... clean, good kitchen and well equiped with everything you need for cooking. Sitting room very comfy having books about Cornwall, brochures about different places to visit. Very nice to arrive and have milk in the fridge with coffee and tea plus biscuits. Hope cottage is in a good location for driving to different areas of Cornwall.... Fowey (which is delightful) , Newquay, many superb gardens, Eden project and many fantastic beaches near by. Hope Cottage, perfect in every way. A brilliant place to have a break, away from the hustle and bustle of life. Everything you can imagine for a superbly comfortable stay and very close to wonderful Cornish villages and towns. The Eden Project, Fowey, Charlestown, Megavissey, local beaches all within easy reach with good transport facilities. The village is charming and the local information so very helpful. All in all a wonderful Cottage, thanks to the owners thoughtfulness, care and immaculate style. Will come again. November 2017. Guest from Andover stayed for 7 nights. This was our third stay at Hope Cottage and once again it didn't fail to disappoint. Every time we have stayed the cottage has been spotless, with tea and coffee readily available and fresh milk in the fridge. I think the fact we have stayed three times speaks volumes and we are already looking at booking again next year, Hope Cottage is perfect for our needs, only a short drive away from major supermarkets for shopping needs and within half an hours drive of delightful harbour villages. All in all I would thoroughly recommend Hope Cottage for anyone looking for a quiet relaxing holiday with all the home comforts you need. A beautiful, spacious and well equipped Cottage that was ideal for exploring our beloved Cornwall. Great local amenities meant we could 'buy local' for the duration of our stay. Although it was only a 20 minute walk to the local beach, it is not a beach that is good for a 'day at the beach' as it was very close to the local factory and quite 'seaweedy' Having the pub right next door was of course ideal but people should be aware that the noise from there can go on until about midnight, particularly on the nights when live music is on. Guest from Burgess Hill stayed for 7 nights. Hope Cottage is conveniently located for Fowey, Eden Project, and Lost Gardens of Heligan as well as the beautiful beaches at Lantic Bay and Polridmouth and great coastal walks. On street parking is available and, although the train station is nearby, we didn't find this or the pub next door noisy. Indeed there is a train to St Ives which could be a good way to see somewhere on the north side of Cornwall. We flew to Newquay which is just 30 minutes drive. There are a few convenience stores nearby including the village community store, a Spar and a Co-op. The cottage itself has a well equipped, modern kitchen, a large bathroom with shower and bath, and comfortable beds. Pleased you have made use of the local attractions & beaches. Yes, lots of visitors use the train to visit St Ives & Penzance, it avoids congested roads & car parks especially during the summer months. The Newquay branch line from Par is good too! Guest from Biggleswade stayed for 7 nights. easy to walk to the beach, train station across the road and ideal base for exploring beautiful Cornwall. The cottage is tastefully decorated with everything you need from walking books/ maps to reading books. We did eat in the pub but the food wasn't great. Handy for a quick simple meal but worth venturing further afield. The Catch chip shop in the village was great, cooked to order, good value and delicious. We would definitely stay again if we're in the area. Great cottage and great weather who could ask for more! Second stay in this lovely cottage, didn't disappoint. Hope Cottage is a great base for touring the area. All the home comforts you need, we enjoyed a relaxing week, with gorgeous weather and are looking forward to our next stay already! Thank you for your review, we are so pleased you enjoyed your second stay. Guest from Holt stayed for 7 nights. A very clean comfortable cottage which is located very close to the railway, hence a little internal noise! Although next door to the pub, their music was very quiet, so don't be put off by that. Great shame the owners don't provide towels ,as when flying , a bath towel weighs heavy! Otherwise a great location, for visiting the attractions.with the train station of Par just 100 metres away.. Guest from Colyton stayed for 3 nights. We stayed for three nights in May, to visit the Eden Project and The Lost Gardens of Heligan. Very comfortable, well equipped house in an excellent situation. Spotlessly clean, and we much appreciated the house being equipped with cleaning materials, washing up liquid etc. There was also a bottle of wine, tea, coffee, milk, biscuits.....However, we had to put the FIVE air fresheners in the laundry, as we feared being asphyxiated. Would recommend to friends, and plan to visit it again. This is a charming little cottage with decent-sized bedrooms and plenty of living space. In general it was spotlessly clean although the pots and pans were sticky with long-term grease (I'm fussy and my pans aren't allowed to blacken) and the washing machine needs a good clean at top temperature with a dishwasher tablet or cleaner (washed laundry came out smelling stale). The noise and smell from the extractor fan for the pub restaurant that backs onto the cottage was a little disruptive but only if windows/doors left open. My biggest problem was the comfort of the bed. I have a partially-immobilised spine. The bed was very soft which my partner loved but resulted in me barely sleeping and suffering appalling back pain all week. This won't be a problem for most people but I would prefer to have known before booking. The sofas also look great but aren't terribly comfortable for more than a few minutes. I know this sounds negative, but we actually had a lovely week at the cottage and enjoyed our holiday immensely. Thankyou for your review. If a guest has a specific condition/requirement, a quick chat or email prior to booking is always welcome. The beds are medium firmness, pocket sprung.we try to choose something to suit the majority of people. We generally receive good scores for comfort & cleanliness. We always aim to provide a good standard of accommodation at a reasonable price. Hope cottage was a cosy and homely cottage, we had a relaxing week. Brilliant powerful shower and beds really comfy. The only problems we encountered were that the step just before the gate was quite a hazard for our 1 and a half year old toddling granddaughter. She toppled down the step and bumped her head on the concrete on one occasion during the week. I note that the step is highlighted on the edge with white paint but as a baby, she wouldn't recognize the signs. I noticed on a previous review that there was some train noise - because of the glorious weather, (especially for beginning of April) we slept with the window open all week and I only heard the train on the first night. It didn't cause any in our party any bother or disturb us at all. Thank you for a lovely week. Pleased you had a nice week & such good weather. Sorry to hear your granddaughter fell on the step. As cottage owners we take time to look for things that may cause a hazard & bring them to visitors attention, hence the white strip to highlight the 6 " step. Guest from Par stayed for 12 nights. Comfortable, clean, homely cottage with everything needed for a relaxing self catering holiday. Good for different walks and for driving to all major attractions etc. Guest from Cambridge stayed for 3 nights. Guest from Crediton stayed for 7 nights. We are pleased you enjoyed your stay overall, & had good weather. The washing machine is new & has long & short settings, instruction book hangs above it. The duvet is a 4.5 summer tog.The trains do not run overnight & do not bother most guests, a useful way of getting about & missing the traffic. There is a sunny seating area to the front of the cottage. Guest from Pickering stayed for 7 nights. Guest from Barrow-upon-Soar stayed for 7 nights. A Heatwave week at Hope Cottage! Arrived approx 5.00 pm and walked into a welcome cool cottage that set the scene for a great week ahead. No worries with the Royal Inn being next door,we took part in their quiz night on Wednesday and sampled their local cuisine. Found Par Sands the most easily accessible for a beach but loved Charleston Bay just to sit and chill out. The cottage has everything included for a stress free stay and despite the small exterior it is spacious and well equipped with bags of information on local places to visit and time permitting would love to visit again. One piece of advice.. to visit Fowey, park in the main top car park and take the bus into the town as it is a steep walk inc steps down ! Thankyou for the review. Take signs for Bodinnick car ferry, there are 2 car parks near the ferry & it's a fairly level riverside walk into Fowey, about 10 minutes. The minibus stops at all car parks, & outside the church. Hope that helps! Lovely cottage, very clean and very well appointed. Wi fi a welcome bonus. We will be back I am sure. Next time I would like to order more sunshine!! Thankyou for the Review. The Cornish will tell you "it's always sunny in Cornwall, & if it is... liquid sunshine...It will dry up dreckly!! Guest from Mühlhausen stayed for 7 nights. The flat was very nice. All rooms are very cleanless and the bed was not to hard. The kitchen have all things what we need. We are started from here to visit a lot of gardens in cornwall. Guest from Andover stayed for 4 nights. My partner and I thoroughly enjoyed our stay in Hope Cottage. It was clean and comfortable with everything you could ask for in a holiday home. The cottage is surprisingly roomy, with both bedrooms being large and bright and the décor is wonderfully calming. The pub next door was an added bonus with good beer, good food and a friendly atmosphere. Already looking at dates to book again for next year! Thankyou. We try to make it feel "homey & comfortable"
Guest from Tewkesbury stayed for 3 nights. The cottage was lovely, very cosy, tidy with all mod cons, location was good, not far to travel to the places we wanted to see, the pub next door does excellent food too. We walked to Par sands on our first evening nice and easy to find and a lovely secluded beach. Acces to both Eden and Heligan doesn't take long either . Would definitely recommend and re-book. Thank you. Thankyou for your review. We are pleased you enjoyed the short break. Guest from Lancing stayed for 5 nights. This cottage was much better than we expected. Lovely location for either driving, walking or using the busses or the train to explore Cornwall. We found the pub right next door an added bonus, good food and guest ales. Parking in the road right outside was never a problem nor the sound of the trains. The cottage is very spacious with light and bright décor. It has every thing that's needed and more. It was lovely to come back to after sightseeing, warm and welcoming. We would recommend a stay at Hope Cottage. Guest from Ravensden stayed for 7 nights. Warm and welcoming on a cold November day. Spotlessly presented. Great location for public transport links. Only minor gripe is TV reception is variable - perhaps more important on dark evenings. Guest from Dumfries stayed for 7 nights. This cottage is fantastic! Clean and cosy on arrival. Probably one of the nicest cottages I have stayed in over the years. Well equipped with everything you need including a washing machine. Tea, coffee, milk and biscuits were there for us when we arrived. Very welcome aftwr a long drive from Scotland! Situated very near to the station at Par meant we didnt need to use the car every day and train fares were cheap too. Short walk to all the local amenities including a fab fish and chip shop. Good for buses as well. Would love to return to Hope Cottage. Thankyou so much for a lovely review. We are very pleased you all enjoyed Cornwall and your stay at Hope Cottage. We supply Tea,Coffee, Sugar, Biscuits & uht Milk so that our guests are able to make a drink if they arrive with no supplies. There are food shops very locally, some open untill 11pm. Our main aim is to provide good quality accomodation at an affordable price. Guest from Willingham, Cambrudge stayed for 7 nights. Hope Cottage was a lovely little place. The only problems I incurred were the lounge area smelled a little musty, not lived in and the bread bin had very mouldy bread rolls left in it. The owner was extremely helpful and apologetic when I phoned to let them know the DVD player didn't work. Little niggle....didn't say in the details that there was a hair dryer in the main bedroom. No mention of a washing machine out in the outside room, and really think it would be better with a downstairs toilet. It was further from the beach than I thought but that didn't matter too much. The local pub The New Inn is an absolute must see. Very welcoming, lovely locals. Would I return? Absolutely! Thankyou for your comments. Hairdryer & washing machine have been added to details. New DVD installed. Apologies for the bread! musty smell a mystery, house is very well used & we have air fresheners around. The beach is about 1/2 mile level walk or a few minuites by car. Sorry but we do not have a ground floor toilet. From the moment we arrived we felt at home. Its a great size and we will return without any doubt. There were little touches that just made it so nice. The location was perfect for exploring the area and the locals were so friendly. The price was great and the bed was just right. Guest from Middlesex stayed for 7 nights. Guest from Chadlington stayed for 7 nights. We had a lovely stay at Hope cottage. The cottage was really well presented, clean and comfortable and had all the equipment we needed. The owner has taken great care to make a stay at this cottage enjoyable with loads of little touches like local maps and interesting DVDs etc. Hope cottage is in a great location for exploring Cornwall and Tywardreath is a lovely down to earth village with a lot of local amenities. Would be very happy to stay here again in future. Guest from Letchworth Garden City stayed for 7 nights. A pleasant week's stay at Hope Cottage which was well equiped and comfortable. Good location and visited Eden project, Fowey, Looe, Megavissey and Bodmin on the steam train. Enjoyed Polkerris beach n Par Sands. Good value for money rental. Guest from Preston stayed for 28 nights. This is a very pleasant cottage. The owners have equipped the cottage well and have gone that extra mile to help you find your way around the local area. I hope to return to Hope cottage in the near future. Hope Cottage was all it promised to be and more. Plenty of information available to help anyone to enjoy the area. Excellent pub restaurant next door. Easy access to all of Cornwall. Bed uncomfortable. Duvet too warm, no alternative. Pillows poor quality. Some railway noise. Plenty of info. provided. House warm, plenty of hot water. The beds/bedding/linen are of good quality. The duvet is a summer 4.5 tog, A 10.5 is also available. A lightwieght fleece throw is provided. If a guest is still to warm I would suggest using the duvet cover only, possibly with the fleece on top! There is a chest of drawers full of linen if guests still want an alternative. We thoroughly enjoyed our stay, the cottage was immaculate, my husband saying it was the best we've stayed in. Being next to the pub was a positive!!! Daisy Lodge is located in the award winning, Eden Valley Holiday Park and only a short walk from the quaint village of Lanlivery. This is a wonderful location with access to both coasts, Lanhydrock House and gardens, the Eden Project and the atmospheric fishing villages of Charlestown, Fowey, Looe and Polperro. Low occupancy discounts based on a couple sharing one room.